0	0	The Freedom Of Self Forgetfulness	In Stock - Order before 4pm for same day dispatchWant it on Wednesday 24 April? Find yourself stuck in a cycle of self-condemnation? This is one of the questions the Apostle Paul addresses as he writes to the church in Corinth. He's not after some superficial outward tinkering, but instead a deep-rooted, life-altering change that takes place on the inside. In an age where pleasing people, puffing up your ego and building your resume are seen as the methods to 'make it', the Apostle Paul calls us to find true rest in blessed self-forgetfulness. In this short and punchy book, best-selling author Timothy Keller, shows that gospel-humility means we can stop connecting every experience, every conversation with ourselves and can thus be free from self-condemnation. A truly gospel-humble person is not a self-hating person or a self-loving person, but a self-forgetful person. 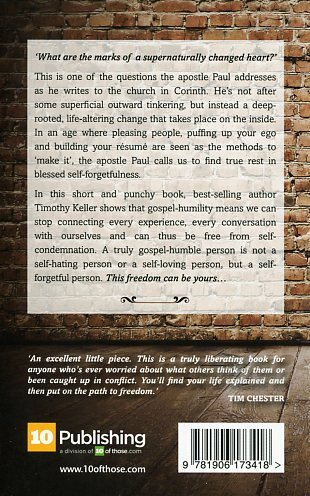 The Freedom Of Self Forgetfulness by Timothy Keller was published by 10 Publishing in April 2012 and is our 141st best seller. The ISBN for The Freedom Of Self Forgetfulness is 9781906173418. This short well presented little book is only 44 pages long, so more a short contemplation piece than a full book, however the issues it deals with and raises in those few short pages are actually really very deep. Based around 1 Corinthians 3:21-4:7, Paul's dressing down to the Corinthians about whose followers they profess to be, this book addresses such issues as pride, self-worth, how we define ourselves and how we promote ourselves and others. Therefore all the big ego issues are here - ones especially rife in our modern society of building up self-worth and high self-esteem - and Keller in turn, using Paul’s teachings, tries to break those down, bringing us to the realisation that true humility is to let go of these things and in turn relinquish ourselves over to God and in turn through this we gain true freedom and true joy. It’s a book that many of us probably need to read, especially those perhaps trapped on a ladder of modern expectations, be that expectations of career growth, family designs or even ministry development. Got a question? No problem! 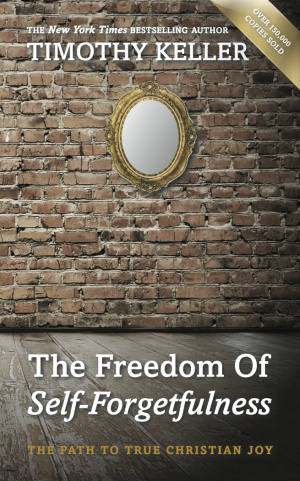 Just click here to ask us about The Freedom Of Self Forgetfulness. "Tim Keller knows that personal freedom is only ever found in viewing yourself from the vantage point of the person and work of the Lord Jesus Christ. Read and experience that freedom yourself." "An excellent little piece. This is a truly liberating book for anyone who's ever worried about what others think of them or been caught up in conflict. You'll find your life explained and then put on the path to freedom."